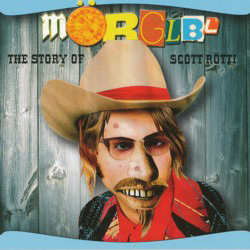 Another bizarre cover in a spoof-Western style encases ‘The Story Of Scott Rötti’, the latest offering from loveable French fruitcakes Mörglbl. ‘The Story Of Scott Rötti’ – the trio’s seventh album – serves up an hour’s worth of genre-bending instrumental material in the vein of, say, Steve Vai for the want of a point of reference for the uninitiated (their website actually describes them as “Primus meets Steve Vai or The Beatles meet Pantera” which might or might not give you a feeling for their particular ballpark). What is more certain is that guitarist Christophe Godin, bassist Ivan Rougny and drummer Aurélien Ouzoulias are masters of their craft, and despite the rather offbeat (but wholly normal, for this band ) cover art what you get when you press play is a hybrid of heavy riffing and fluid soloing with a soupçon of jazz, a heavy smattering of humour and a massive injection of talent from three incredibly gifted musicians. With over twenty years of history behind them – their first release ‘The Mörglbl Trio! !’ was unleashed on an unsuspecting world in 1998 – somewhere along the line they probably wrote their own rulebook which undoubtedly says something like ‘there are no rules’ (aside from perhaps a footnote that their album covers have to be rather off-the-wall). Yet although they might not take themselves too seriously, their music is a completely different kettle of fish. Everything is impeccably composed and flawlessly executed to create a perfect fusion of genres and a triumph of both style and substance. Repeated plays throw up more and more subtleties and nuances within the finely-honed compositions, and one of their (many) strengths is their ability to switch from pleasant to pugilistic at the drop of a hat as songs like ‘Les Légions Du Rhum’ ably demonstrate. The attention-grabbing opener ‘2 Flics Amis Amish’ is a heavy little mofo, while ‘Prog Töllög’ exhibits all the splendour and fluidity you’d expect on an album by the likes of Joe Satriani. Given that Mörglbl are so damn good at what they do, it’s a mystery as to why they still aren’t already a household name.